Introduction: Sentinel lymph node (SLN) mapping can improve the accuracy of colorectal cancer staging. However, previously described methods, when it comes to laparoscopic procedure in particular, are both time-consuming and annoying because they require additional procedure. The aim of this study is to evaluate the accuracy of modified in-vivo lymphatic mapping, which can be done without taking the step of intraoperative navigation. Methods: 45 patients underwent SLN mapping from March 2007 to September 2007. 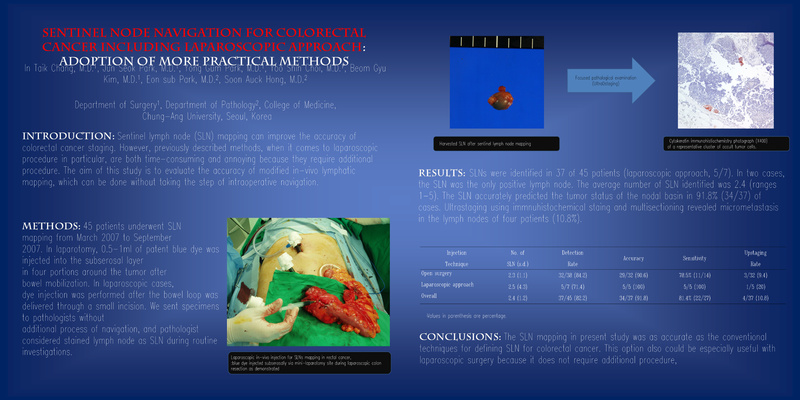 In laparotomy, 0.5-1ml of patent blue dye was injected into the subserosal layer in four portions around the tumor after bowel mobilization. In laparoscopic cases, dye injection was performed after the bowel loop was delivered through a small incision. We sent specimens to pathologists without additional process of navigation, and pathologist considered stained lymph node as SLN during routine investigations. Results: SLNs were identified in 37 of 45 patients (laparoscopic approach, 5/7). In two cases, the SLN was the only positive lymph node. The average number of SLN identified was 2.4 (ranges 1-5). The SLN accurately predicted the tumor status of the nodal basin in 91.8% (34/37) of cases. Ultrastaging using immnuhistochemical staing and multisectioning revealed micrometastasis in the lymph nodes of four patients (10.8%). Conclusion: The SLN mapping in present study was as accurate as the conventional techniques for defining SLN for colorectal cancer. This option also could be especially useful with laparoscopic surgery because it does not require additional procedure, such as intraoperative colonoscopic dye injection and tagging procedure.